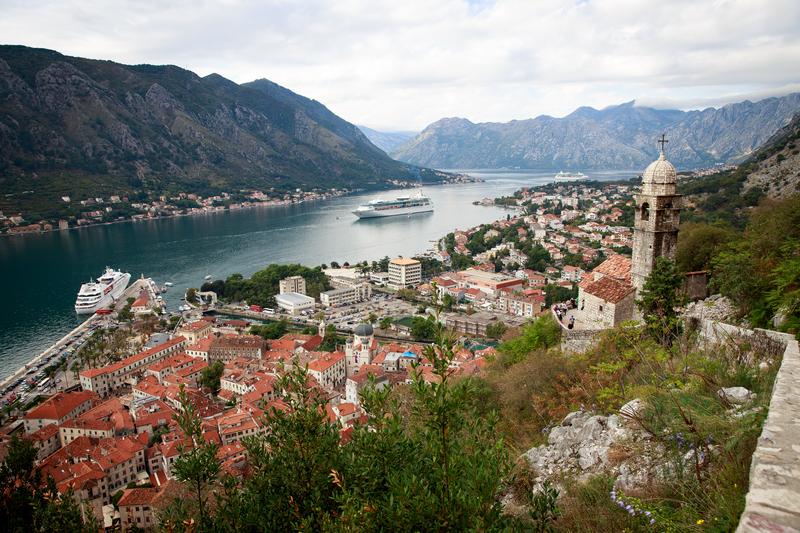 After cruising through the night we awoke early to see the beautiful sights as we made our way into Kotor. 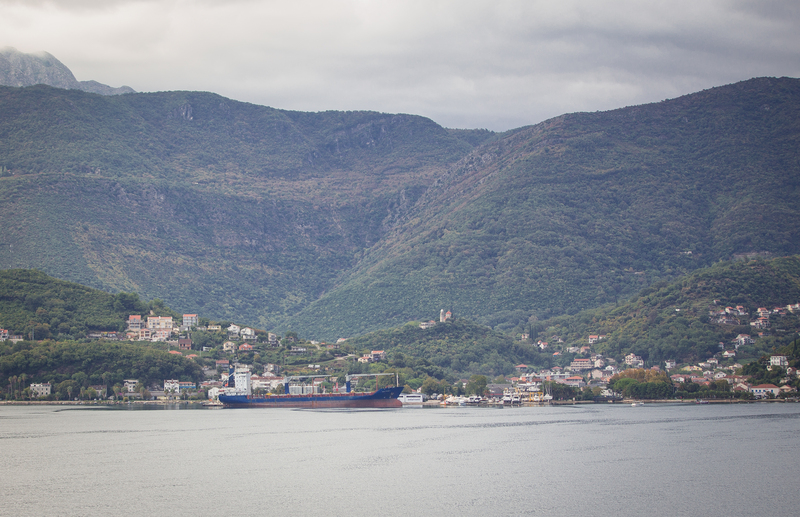 Rain and fog added to the mood as we slowly passed through the Bay of Kotor, or as it’s called there, Boka Bay. The bay is thought to be a fjord with it’s tall mountains, however it was not created by a glacier. This morning we tendered in from the ship and met our guide on the pier to board our bus to venture out of Kotor to the village of Perast. In Perast we boarded a boat to go to a small island in the middle of the bay that is home to Our Lady of the Rocks church. As the boat made it’s way out, the rain and thunder echoing through the valley added to the experience of the excursion. 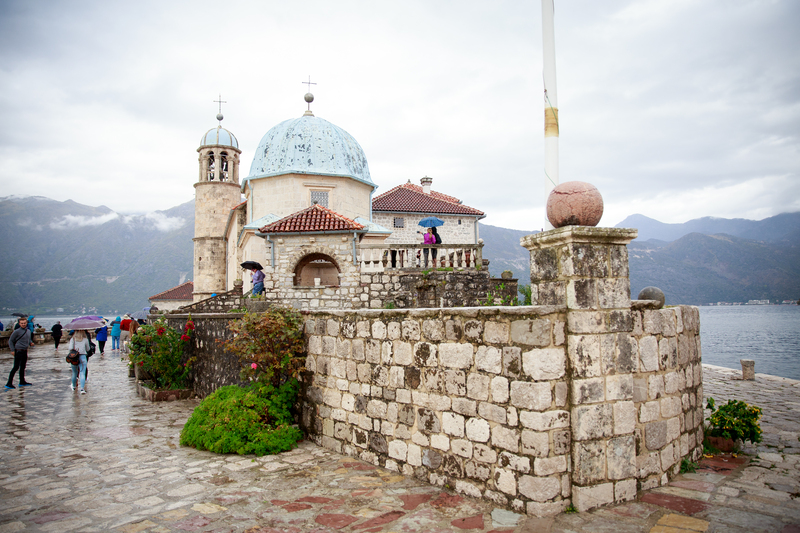 The island was made over hundreds of years by sailors throwing rocks in to build the island, wanting to keep an oath when they found an icon of Madonna and Child. The ritual is still practiced today as locals come by every July 22nd to carry on the tradition of placing rocks to secure the island. 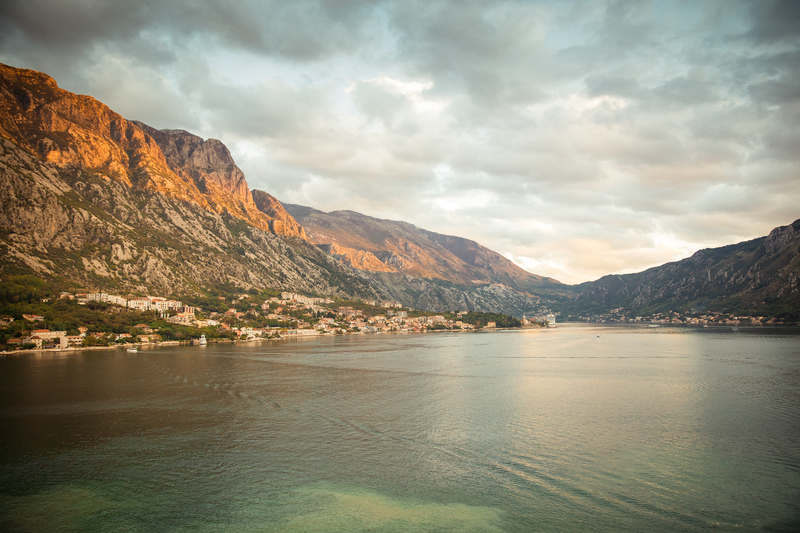 Back in Perast we were able to walk around and take photos of the bay and the beautiful old buildings in the village. There were a few small inns, houses and a fire department along with restaurants and stray cats. The rain began to break and sun started to break through as we made our way back to the bus to venture to Old Town Kotor. On the ride, one side of the bus is against the side of a mountain, the other to the water. There are several mussel farms in the water which is a major industry for the area aside tourism. 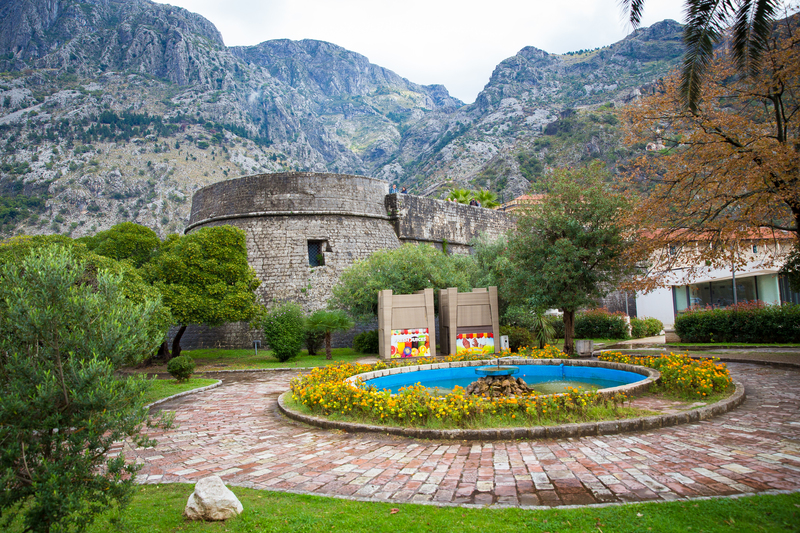 As we arrived in Kotor, we walked toward the gate into the Old Town section. As you make your way in with red tile roofs surrounding you on 3 sides, you a greeted with the clock tower and shame post where people would be brought if they did something that brought shame to their families. Behind you is a long balcony the prince had constructed so he could pace back and forth without fear of getting attacked. The streets are narrow, lined with boutiques, restaurants, pubs and people’s laundry hanging from above. I’d be lying if I said it wasn’t one of the most beautiful places I’ve ever been. Passing by old churches and the gossip pump, where women would come to get water and catch up on the news within the walls. Our group dispersed and we ventured to the entrance to climb the 520, give or take, steps up the side of the mountain behind the Old Town Walls to the Our Lady of Good Health church that overlooks the city and the bay. With every “flight” of steps going up, the views got better and better. While we only had time to venture about half way up, there is more at the top, bring your walking or hiking shoes. With a little time to spare we had some gelato in the square and then ventured to find a pub to sample the national beer of Montenegro, Niksicko, or Nik Beer. For E4.5, we each had a beer, myself the dark and Elise the light. Both we delicious, sadly I couldn’t bring any back with me. The darker beer was crisp with a slight hoppy kick and the light had a very smooth flavor that tasted like another one. While many people told us of beggars and pick pockets, we hadn’t really experienced them until we had one come up to us as we were getting ice cream. She would walk up, stick her hand in your space and say “please” over and over. It appeared that she was carrying a baby with her, though I’ve never seen a baby carried like that. After the 5th time she came up to us, I realized the baby wasn’t a baby, but a doll. Our feet tired, thirst quenched and memory card getting full, we caught a tender back to the ship to watch as we hauled anchor and cruised back out through the bay into the Adriatic. You remember the very talkative couple that lost their luggage as they missed their flight? Well, their bags were located, and if we forgot the first 67 times they told us, they reminded us a few more times in between them exercising their minds as they recited every King and Queen of England to the English people at our table. They didn’t care about that, but the cheddar rolls that Maria from Russia kept giving us were excellent. After dinner we ventured to the theater for the Piano Man show, a tribute to Elton John, Stevie Wonder, Billy Joel, Ray Charles and more. The performers are on their game as they dance around despite movement of the ship with the waves. I counted at least 5 times that if it were me, that’d be in the hospital having my ankle reattached. Tomorrow we are at sea as we make our way to our next stop, Santorini. wow, these are just breathtakingly beautiful.